During our time here at the library we have received various photos from the patrons. We appreciate it when others are willing to share their findings with us. Without you, we would not have the great collection of evidence that we now have. Each bit of evidence we receive is looked at and gone through to the best of our ability. Photo are generally fairly dark because of the lack of lighting during a Ghost Walk. The guideline I use is “less is more”. The only editing I add to any photo sent in is lightening or darkening for better visibility of the object/spirit in question or cropping to allow a closer more detailed look. By keeping the editing to a minimum we are able to maintain the quality and crispness of the original photo. First is the “ghost girl” shared by Kyle and Shalise Lamb. The original photo was taken during the 2011 Ghost Walks. Once they were home perusing their photos they noticed a little someone peeking out from the new book display. 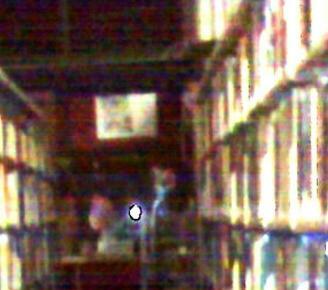 Second, is Lindsay Parks photo of the “dark shape” in the stacks. Her photo also was taken during a private Ghost Walk. Again, no one saw the shape during the event, but it was clear there was someone watching the activity at the time. Third, is Paula Birrell’s photo dubbed “the man in the top hat”. 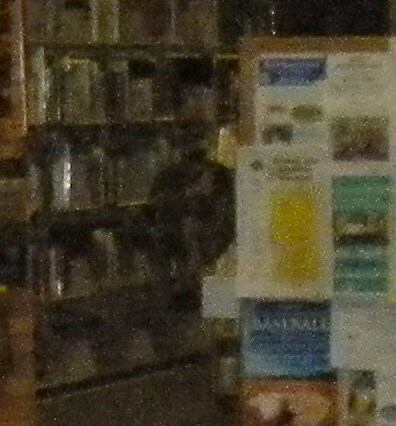 During a 2010 Ghost Walk, she saw movement from the back of the library towards the Front Desk and snapped a photo. Boy are we glad she did. Once the photos are sent to me I begin the task of checking for anything that seems wrong or Photo Shopped. I am not an expert but I always try to debunk what I can. Several times we have received snapshots of what seemed to be paranormal, but were nothing but shadows and light altering what was in view. Although we do have several shots that have been proven to be non-paranormal, we ask the public to continue to share their findings. It seems, you the public/patrons are the ones that seem to get luck. 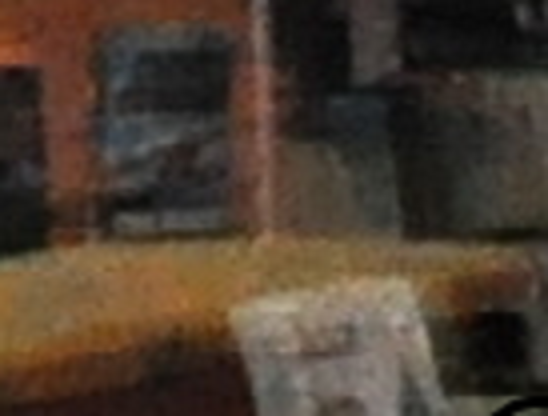 Very rarely have staff been able to catch images of the ghosts among us. Your images can help to show the existence of spirits among us. If you have evidence now or ever please feel free to send it my email to: mgilmore@sweetwaterlibraries.com. The end of every summer, people bring the library boxes of used books. This year was no exception. Along with all the fiction, science fiction, mysteries and westerns are a good amount of paranormal books. I was very pleased to be able to add these to our collection. There are a huge variety of titles out there and it would be impossible for the library to buy them all. It is a nice surprise to open a box of donations and find like-new titles. We received books on everything from Bigfoot to poltergeists. 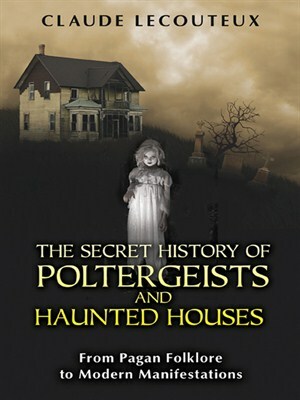 You might enjoy reading The Secret History of Poltergeists and Haunted Houses by Claude Lecouteux. This book states it covers from pagan folklore to modern manifestations. Stories of poltergeists and their mischievous and sometimes violent actions—knocking, stone or chair throwing, moving objects with invisible hands, and slamming or opening doors—are a constant through the ages. What changes is how we interpret this activity. For our pagan ancestors poltergeists were seen as helper spirits whose negative manifestations revealed their unhappiness with a household. The medieval Christian church demonized these once helpful spirits and held exorcisms to expel them from the houses they haunted—which proved effective less than half the time. The Age of Enlightenment cast these incidents as clever hoaxes, and many still believe this today. But poltergeist manifestations continue to appear and often defy attempts to debunk them as pranks. What then is behind this phenomenon? Exploring accounts of poltergeists from ancient Greece and Rome, medieval Europe, and the modern world, Claude Lecouteux finds that while our interpretations of poltergeists many change, the manifestations always follow a similar course and evolution. He shows how modern scientific studies of poltergeist manifestations have found a strong tie between these visitations and the presence of a trouble adolescent in the house. Looking beneath the Christian adulteration of pagan practices to reveal the hidden ancestral beliefs tied to poltergeists and haunted houses, the author shows how these unhappy spirits serve as confirmation of the supernatural beings that share the earth with us and of our relationship with the natural and unseen world, a relationship we must take care to keep in balance. Claude Lecouteux is a former professor or medieval literature and civilization at the Sorbonne. He is the author of numerous books on afterlife beliefs, including The Return of the Dead and The Secret History of Vampires. When looking for something to read regarding our haunted library, there are a couple choices. On our shelves are Ghosts on the Range by Debra Munn, Wyoming Ghost Stories: eerie true tales by Debra Munn, and Wyoming Curiosities: quirky characters, roadside oddities, and other offbeat stuff by Dina Mishev. These and many more are perfect for this time of year. Happy reading!! Private ghost walk to be held on October 31st from 11 pm to 1 am. Winner gets a private ghost walk for up to eight persons. Must be 15 yrs. or older to attend. Bids will be accepted starting October 13st and close on October 25th. The winner will be notified the following Monday. Minimum bid starts at $25.00. Bid increases must be at least $5.00 above previous bid. Each bidder must sign an agreement slip or authorize a staff member to do this for them. Please initial in “received by” on all slips please. All money raised will be donated to the Sweetwater County Library System Foundation.